The International Monetary Fund said it was studying a request from Argentina to speed up disbursement of a $50-billion loan program after a collapse in investor confidence in President Mauricio Macri’s government sent the peso tumbling more than 7 per cent on Wednesday. It was the biggest one-day decline in the peso since the currency was allowed to float in December 2015. It closed at a record low of 34.10 per U.S. dollar and is down more than 45.3 per cent against the greenback this year, prompting massive central bank interventions. 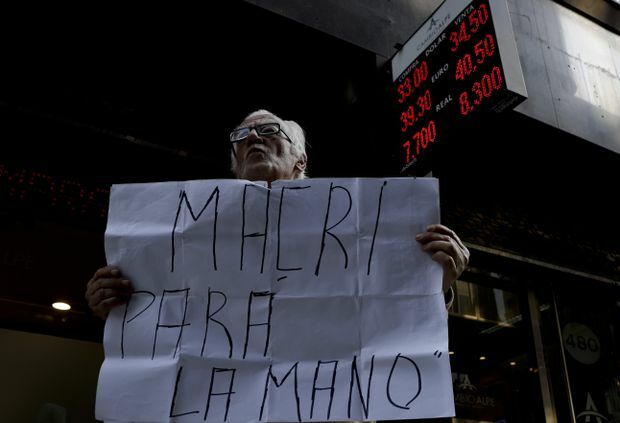 A man holds a sign reading in Spanish 'Stop Macri' outside a currency exchange office in Buenos Aires on Wednesday. The run on the peso prompted Argentina to turn to the IMF for the $50-billion credit line earlier this year. As part of the deal, Argentina’s government pledged to speed up plans to reduce the fiscal deficit. Argentina has $24.9-billion in peso– and foreign currency-denominated debt payments due next year, according to official data. Speaking to reporters after the IMF statement was issued, Treasury Minister Nicolas Dujovne said the government would reduce the size of its financing program, but did not provide specifics. The peso’s decline has contributed to a jump in inflation, which hit a 12-month rate of 31.2 per cent in July. In response, the central bank has hiked interest rates to 45 per cent and sold more than $13-billion in reserves, including $300-million in an auction on Wednesday. All that, combined with the budget cuts promised to the IMF that will slow down public works projects, is contributing to a recession that will result in an economic contraction of 1 per cent this year, according to the government. That could hurt Macri’s re-election prospects in next year’s presidential race. The June signing of the IMF deal reduced the need for costly bond market funding and briefly steadied the peso. The government has since announced more than $2-billion in budget savings, a process Macri promised to continue.